The brain and the spinal cord make up the central nervous system. The nervous system is the most complex and highly organized body system. It receives information from the sensory organs via nerves, transmits the information through the spinal cord, and processes it in the brain. The nervous system directs our body’s reactions to the world and also controls most of our internal functions, everything from muscle movement and blood vessel dilation to the learning of anatomy and physiology facts. How does it manage all this? By sending lightning-quick signals, electrical and chemical, between cells. 1. The Brain and Spinal Cord Are the Central Nervous System. Nerves and Sensory Organs Make Up the Peripheral Nervous System. 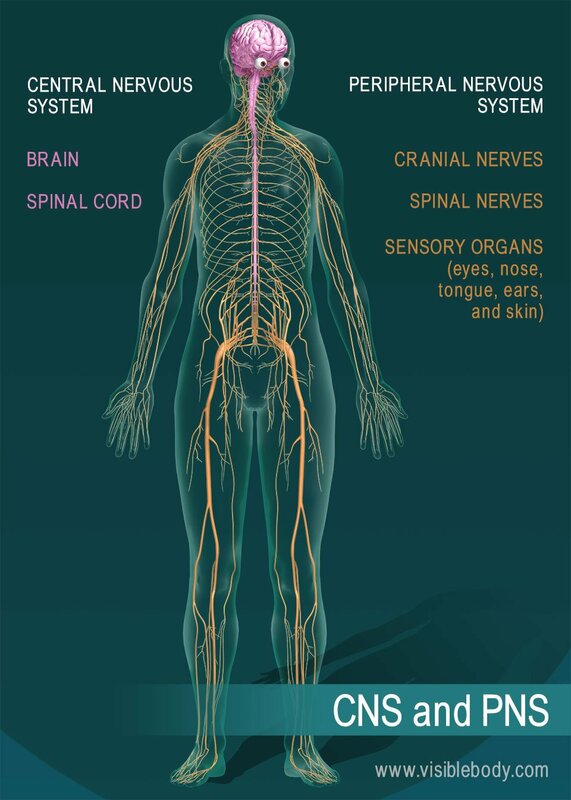 Together, the central nervous system (CNS) and the peripheral nervous systems (PNS) transmit and process sensory information and coordinate bodily functions. The brain and spinal cord (the CNS) function as the control center. They receive data and feedback from the sensory organs and from nerves throughout the body, process the information, and send commands back out. Nerve pathways of the PNS carry the incoming and outgoing signals. 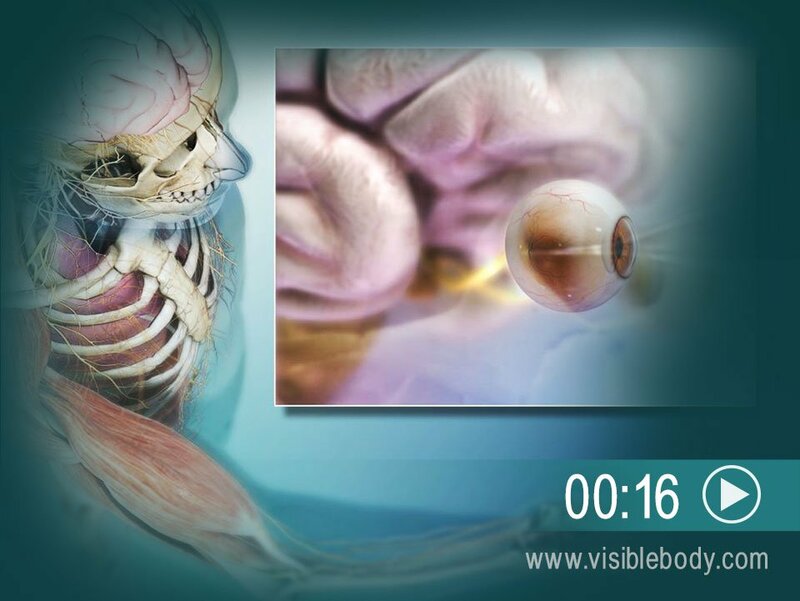 Twelve pairs of cranial nerves connect the brain to eyes, ears, and other sensory organs and to head and neck muscles. Thirty-one pairs of spinal nerves branch out from the spinal cord to tissues of the thorax, abdomen, and limbs. Each nerve is responsible for relaying sensory information, sending motor commands, or both. All nervous tissue, from the brain to the spinal cord to the furthest nerve branch, includes cells called neurons. Neurons are charged cells: they conduct electrical signals to pass information through the body. 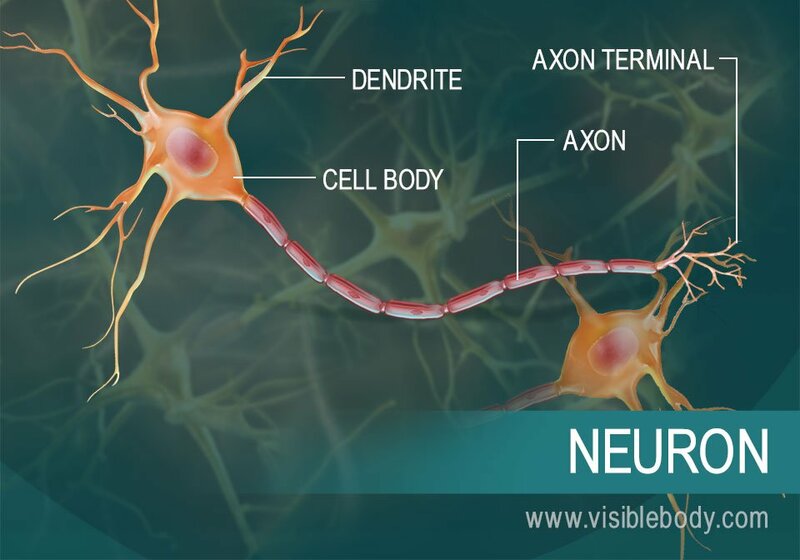 A typical neuron consists of a cell body, dendrites, and an axon with an axon terminal. The dendrites receive signals from body tissues or other neurons and pass them into the cell body. If an outgoing signal is produced, it zips down the axon to the axon terminal and passes to the next neuron or target cell. 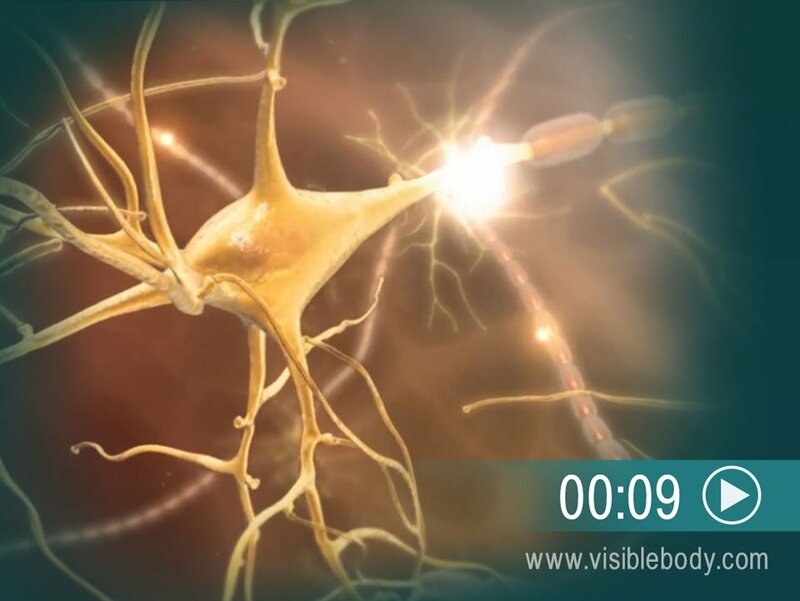 This conductive capability sends information up and down nerve pathways and through the central nervous system at incredible speed. Some 100 billion neurons give the brain its awesome processing power. Nervous system messages travel through neurons as electrical signals. When these signals reach the end of a neuron, they stimulate the release of chemicals called neurotransmitters. Neurotransmitters travel across synapses, spaces between neurons or between neurons and other body tissues and cells. Neurotransmitters can be classified as two types: excitatory or inhibitory. Excitatory neurotransmitters stimulate electrical signals in other neurons and encourage responses from body cells. Inhibitory transmitters discourage signals and cellular responses. Through these chemicals, the nervous system regulates the activity of muscles, glands, and its own nerve pathways. 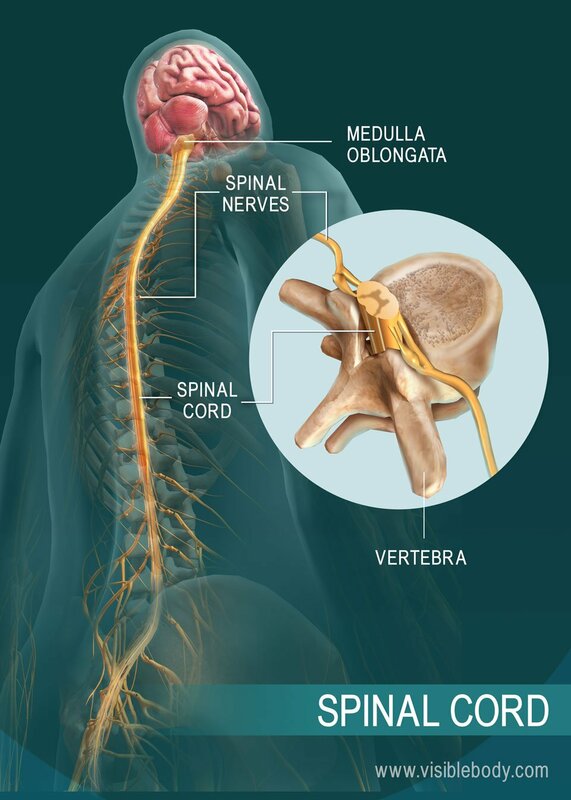 The spinal cord is an elongated cylinder of neuron cell bodies, bundles of axons and other cells, protected by connective tissue and bone. It connects to the brain at the medulla oblongata and runs down the vertebral column, the hollow tunnel enclosed within the vertebrae of the spine. The spinal cord is part of the central nervous system and serves as a kind of superhighway. Sensory information and motor commands travel up and down, heading to and from the brain. These signals speed in and out of the spinal cord via spinal nerves—the “on-ramps and off-ramps” that branch out to supply the limbs, torso, and pelvis. Some incoming signals demand a simple, immediate response. The spinal cord can shoot out a reflex command without bothering the brain. The nervous system does more than route information and process commands. Why do certain smells immediately raise particular memories? The answer appears to lie in the limbic system. 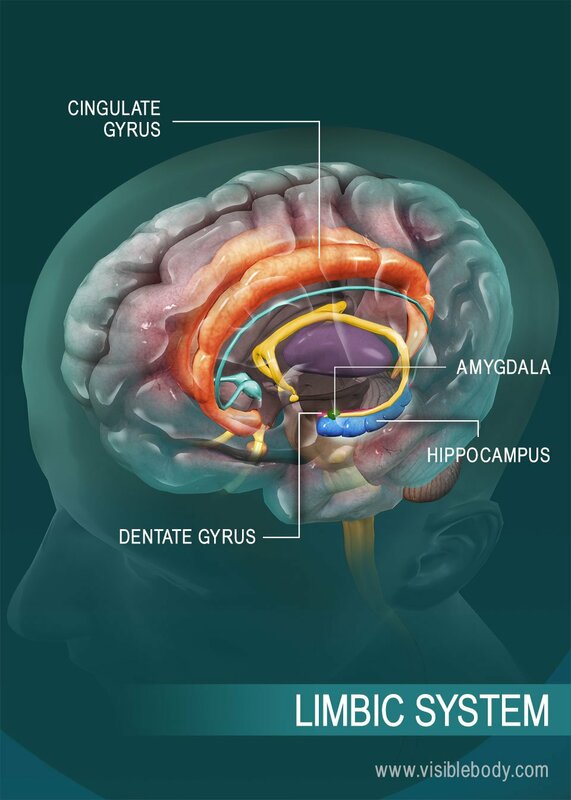 The limbic system forms two paired rings within the brain, consisting of the hippocampus, the amygdala, the cingulate gyrus, and the dentate gyrus, along with other structures and tracts. As with other brain segments, the limbic system is involved in multiple nervous system functions and levels of activity. It helps to process both memory and olfaction—our sense of smell—and it manages a range of emotions. The aroma rising from a pot on the stove may send your hand reaching for a spoon. It may also call up a dinner from earlier times, and make you happy, regretful, or nostalgic. A description of the nervous system from the 1918 edition of Gray’s Anatomy of the Human Body. A reference list of nervous system terms from the Des Moines University Online Medical Terminology Course.